Hoolihan/Big Chuck with Andy Griffith..February 17, 1967-In Color! Here is some extremely rare video from the first months of "Hoolihan and Big Chuck" CBS-TV Star Andy Griffith is featured in a sketch as a country bumpkin trying to make it into show business, first aired Friday, February 17, 1967. Andy does a bit of his classic "Football" sketch and mentions his "buddies" Don Knotts and Tennessee Ernie Ford..In doing research I foumd that Griffith, Ford and Knotts were stars of an upcoming CBS special, The Andy Griffith Uptown-Downtown Show"..as mentioned here in "Time" Magazine 2-17-67..
ANDY GRIFFITH'S UPTOWN-DOWNTOWN SHOW (CBS, 8:30-9:30 p.m.). Tonight it's Don Knotts, Tennessee Ernie Ford, Maggie Peterson with the Bruce Davis Quintet, and a folk-rock group known as the Back Porch Majority." Thanks to Ghoulart for the Griffith Sketch..
From THorsman88 and YouTube: a repeat of a video montage honoring the Cleveland Indians, which I posted last October..The Tribe opens its home season at "Progressive Field" tomorrow afternoon at 3:05 PM against the Chicago White Sox..Its looking good for the Indians this year, after nearly making the World Series in 2007..Along with the video are two classic Indians Songs:Indian Fever and Talkin' Baseball..Talking Tribe, along with Michael Stanley's "This Town is My Town.."
A fascinating Clip from the "Mike Douglas Show..Apparently from July 13, 1967. Patty was co host this particular week..She and Douglas sing the then-fairly new Frank Sinatra Standard, "Something Stupid"..Rose Kennedy was also a guest, as we see from the "out-to-commercial" tag..WKYC-TV 3 probably aired the hour version of the Douglas Show at this time, between 9-10 AM..Thanks to YouTube user PattyDukeTheatre for sharing this clip..Nice color tape quality..
"It's Basketball Time at the Q." Cleveland Plain Dealer Columnist Terry Pluto notes an amazing milestone in yesterday's edition..Cleveland Cavaliers radio voice Joe Tait will be calling his 3,000th game tonight as the Cavaliers play the New Orleans Hornets at Quicken Loans Arena. Except for 2 years in the early 1980's, Tait has been the "voice" and in some ways, the "face" of the Cavaliers Franchise..He has been the one constant throught the team's history..I have been a Cavs fan just about from the beginning..For me, Joe is one of the greats in broadcasting..His signature calls.."Binggoo!" "Wham. with the right hand!".. "Three Ball...Got it! 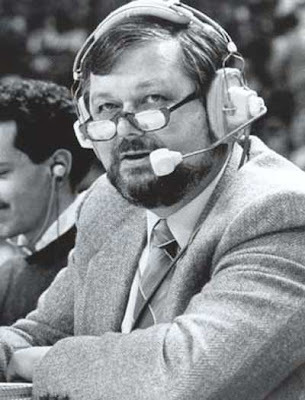 "..He made Cavaliers Basketball entertaining through the expansioin years, and through most of the down years between the Miracle of Richfield, Daugherty-Price era and the LeBron Era..He also found time to Call Cleveland Indians Games in the 1970's and early 80's, as well as numerous high school and college sporting events..Ive never had the chance to meet him, but he always seems to be a real good, regular guy always willing to help others in the broadcasting business..One of my biggest early memories was in February 1972 when the Cavaliers beat the New York Knicks 111-109..The Cavs' first ever win against the Knicks..Youd have thought the Cavaliers won the NBA title...I thought Joe was gonna lose it then..
Congratulations, Joe on your milestone..Only hope now is that you get an NBA title..You deserve it..Thanks for the memories..
Just in from Ohio Media Watch through Scott Fybush's Northeast Radio Watch.."Your Leaaader" Jackson Armstrong, (aka John Larsh) Top 40 DJ who made his name in Cleveland at WIXY-1260 and WKYC-1100 in the mid 1960's, passed away Saturday at his home in North Carolina..His was a long career throughout The US and even in Canada (CHUM)..His last gig was at WWKB , Buffalo in 2006..I was a bit young to have heard him in his Cleveland days, but am always saddened when a part of "personality" radio passes from the scene..Prayers to his family. 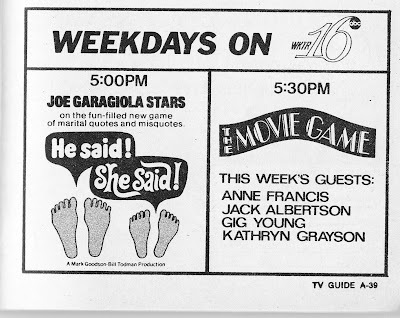 An ad from the Southern Ohio TV Guide in May, 1970. While this is not Northern Ohio related, I included it because of the station featured-WKTR-16 in Kettering-Dayton. This station was on the air in 1968 as one of several Independent stations to come on at the same time in "68. (WXIX-19 Cincinnati and WSWO-26 Springfield were the others.) by mid-1970 channel 16 had taken the ABC affiliation in Dayton and should have been successful as a coommercial station..However, WKEF-22 took back Dayton's ABC affiliation and 16 was forced off the air, later resurfacing as WPTD-Dayton's Public TV station paired with WPTO-14 Oxford, Ohio. 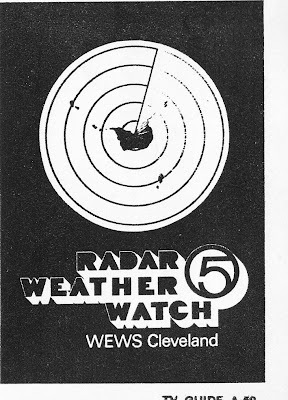 WEWS-TV 5 ad for one of the first local weather radar systems.."Radar Weatherwatch"
TV Guide Ad for WKYC-TV 3's East Ohio Youth Theater Production of "Ali Baba" Sunday, April 19, 1970. 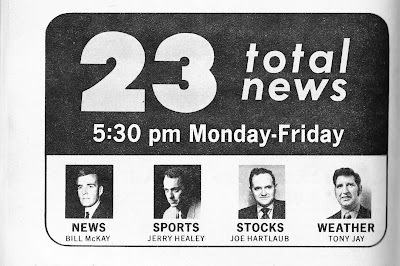 WAKR-TV ad for 23 "Total News" One of many attempts at a local newscast by WAKR-TV 23 in Akron. April 18-24 1970..A few weeks before the Kent State Shootings..The flight of Apollo 13, while scheduled to be in progress, had been aborted April 17. 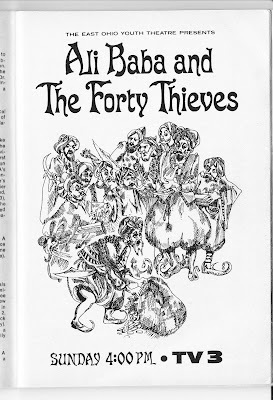 On the TV front, "Barnaby" had returned to channel 43 after Linn Sheldon had retired the character from 1966-69 at WKYC-TV 3, because of wanting to do less kid-oriented TV.. Harry Jones and Dave Martin were calling Indians Games on Channel 8. Hoolihan and Big Chuck were hitting their stride, also on Channel 8..The Paige Palmer Show was now known as "Girlwatch"..WJAN-TV 17 aired programming 10:30AM-Midnight..By the end of the year they would sign on at 2 PM. From YouTube user RobatSea..A 1980 midssummer WUAB-TV 43 Newsbreak with Gary Short sponsored by the Plain Dealer..Announcer is Jack Reynolds..There is a brief Indians promo at the end..WUAB was in their first year as The Indians Broadcast TV home.. Editors Note:As The Newsbreak mentioned the Republican Convention coming up shortly..and it was definitely midsummer weather..The Indians promo mentioned a Tuesday 10:30PM Game with the California Angels, We csn pinpoint the date of the newsbreak between about July 10-14, 1980. The Indians played July 15-17 in Anaheim,,Midweek Baseball series generally were Tuesday-Thursday..
Judd Hambrick, hosting WKYC-TV's 35th anniversary special..aired originally October 31, 1983. A fast paced entertaining 22-minutes..Featured are Linn Sheldon, Bud Dancy, Carl Stern, Wally Kinnan and a few others..
From "VaultDisney" on YouTube..The extended opening, only used once (on the premiere)..of Walt Disney's "Wonderful World of Color"..ABC had aired "Disneyland" since 1954 but had refused to commit to Color TV fast enough for Walt Disney, so in September, 1961 the show moved over to NBC, where it became the foundation for NBC's Sunday night Schedule until Fall 1981. The show maintained an on/off schedule until 2005 on ABC, NBC or CBS..Ironiically, it was a large investment from ABC-TV that got the first Disneyland theme park off the ground in the 1950's..Disney ended up buying the ABC Network in 1997..